Preparing to travel with my little bub is not an easy job! I almost ended up packing the whole kitchen and squeezing it in my luggage (LOL!). I wanted to make sure my little darling will have proper meal just in case he is not use to the food while we are travelling so I've decided that I will be cooking porridge for him. Yes, I will be cooking on the run and still figuring out how to do it "fabulously" and of course I will be travelling with a mini rice cooker. Motherhood - no room for fancy shoes or handbags because you need to make room for the rice cooker togeter with other cooking stuff and baby stuff. I've prepared the Homemade Ikan Bilis Powder (Anchovy Powder) to enhance the porridge taste because the chances for me to cook plain porridge is very high unless I go hunt down a place where I can buy fresh meat and seafood. Not sure I can still go to the wet market in a fabulous way now...LOL! 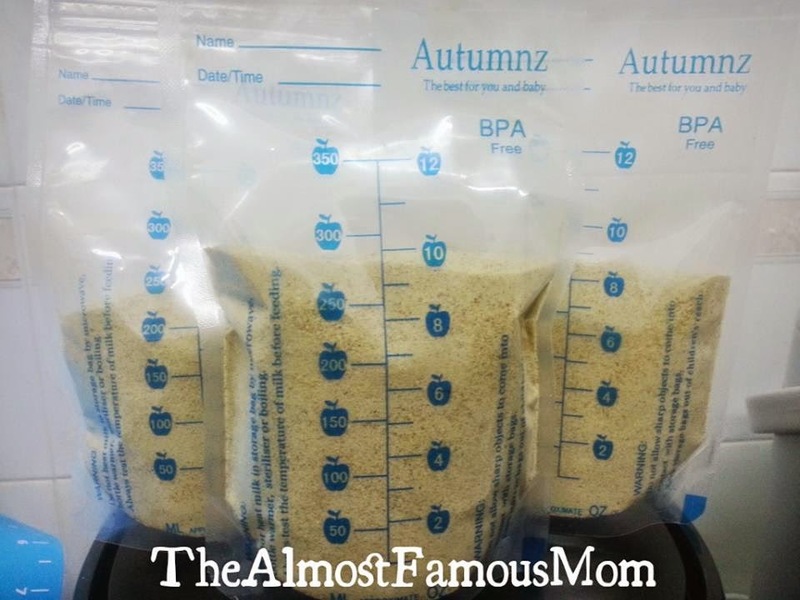 All nicely packed in the breast milk storage bags, compact enough to keep instead of having a bulky container. Rinse the peeled ikan bilis/anchovies in few changes of water to remove the excess saltiness. At the same time, do not over rinse the ikan bilis/anchovies so that it can still have its salty flavoring as a seasoning condiment. Drain the ikan bilis/anchovies and pat dry using kitchen towels then air-dry the ikan bilis/anchovies before baking (takes about 2-3 hours depending on the humidity level). Place the semi-dry ikan bilis/anchovies on a baking pan and spread it evenly. Bake the ikan bilis/anchovies in oven at 200°C for about 15-20 minutes or until golden brown. Be sure to use a wooden spatula to stir the ikan bilis/anchovies half-way through so that it will bake evenly. Once it is done, the ikan bilis/anchovies will have crispy texture. Transfer the crispy ikan bilis/anchovies in the food processor and give it few blitz until they become fine powder. Store in an airtight container and keep in cool and dry place (such as refrigerator). How much powder do u put for a serving of porridge? How long can the powder be kept in the fridge or freezer? It seems like u went on a long vacation cos thats a lot of powder! Bringing my LO overseas in nov and thinking how to cook meals for him while travelling. Appreciate if you could share. Thank you! It can be kept for a pretty long time (just be sure the powder is kept dry and not mouldy). I would suggest you to put about 2 tsp (if cooking with a big pot with lots of water) because if over-added the porridge will be coarse with the ikan bilis bits. I've use it as soup for white rice (just add boiling water to the powder) when i was stuck in Disneyland and running out of LO's food...haha! (just be mindful that the powder will not dissolve completely). I brought along a mini cooker to cook porridge in the hotel and the ikan bilis powder was a wonderful ingredients - i brought along some dried scallops and oysters too. As for veggie, I bought it fresh at the local market.